The Web is an immersive installation that addresses the significance of the Internet and mobile devices in our lives while simultaneously examining the role of the viewer. The idea for the piece came to Jon Kessler on a New York subway ride when he realized that at least half of the riders were speaking on their cell phones, sending text messages, playing video games, or otherwise immersing themselves in their networked mobile devices.The Web is a commission by the Métamatic Research Initiative, Amsterdam. Jon Kessler's The Blue Period is an immersive installation featuring kinetic machines, surveillance cameras, video monitors and life-size cardboard figures. This video-drenched panopticon is the culmination of Kessler's longtime interest in surveillance, alienation and spectacle. The Blue Period is a spiritual descendant of Society as Spectacle, Guy Debord's seminal 1967 critique of the ascendant consumer culture, and the general passivity and isolation it engenders. Riffing on Debord and his fellow Situationists, Kessler has constructed a controlled environment in which social relations are mediated through images of a fabricated, inaccessible reality. Kessler’s Circus places the viewer inside the American war machine. 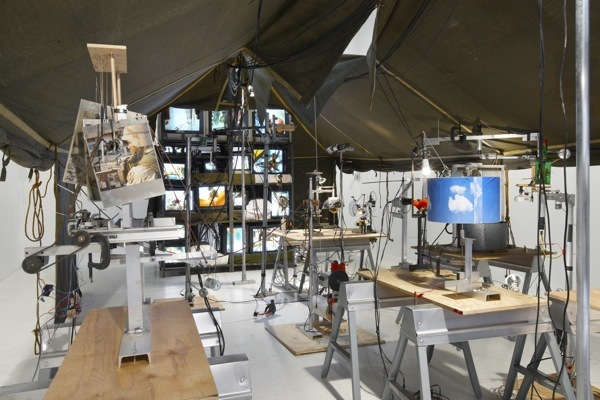 An army tent pitched inside the gallery housed mechanical sculptures and barracks stacked with video monitors. The work depicts the American military-industrial complex as a macabre circus, traveling from country to country, exporting atrocities under the veil of democracy. Rather than simply presenting a mediated spectacle, the artist indicts the audience in the violence. Surrounded by handmade mechanisms and surveillance cameras, the viewer becomes part of the machine. There is an induced sense of vertigo and a surge of paranoia, as the viewer’s own face appears in the video feed. Entering Kessler’s Circus, one is immersed in an undefined state, conflating machine and spectacle with entertainment and horror. A site-specific installation created for P.S.1, this exhibition vastly expands upon a recent suite of works by the artist entitled Global Village Idiot, which opened to critical acclaim in the spring of 2004. The installation at P.S.1 is the largest and most complex Kessler has ever completed, and is his first solo museum appearance in New York.